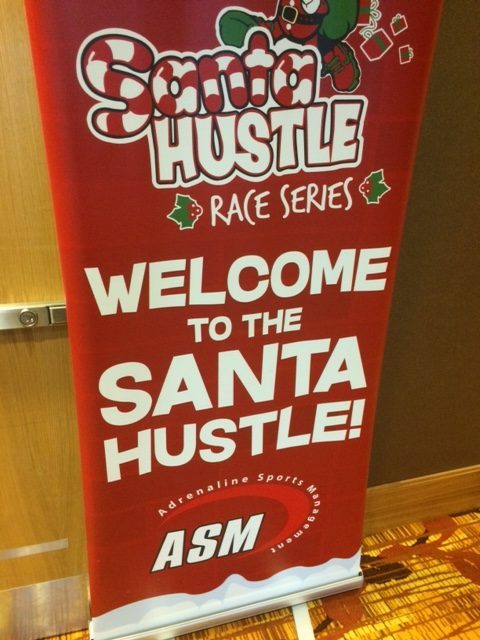 Our interest in the Santa Hustle Race Series actually started with a Facebook message we received from a reader who wanted to know more about the races. Truthfully, none of us had ever run them, so, why not take the opportunity to add another race to our 2016 race calendar? 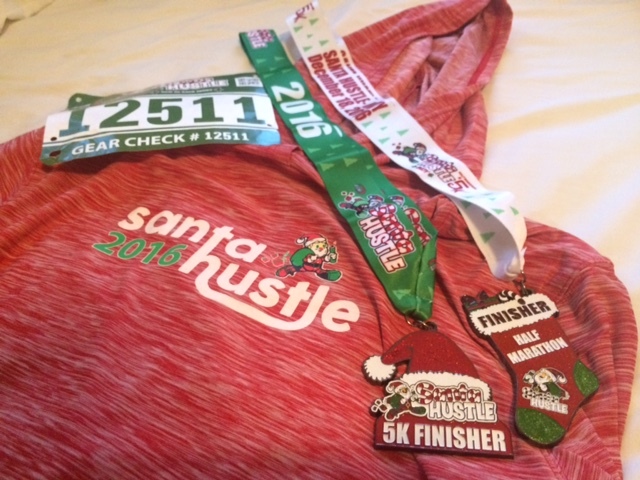 As of this writing, Santa Hustle runs several events (5ks and half marathons) in cities in 9 different states plus a virtual run option. 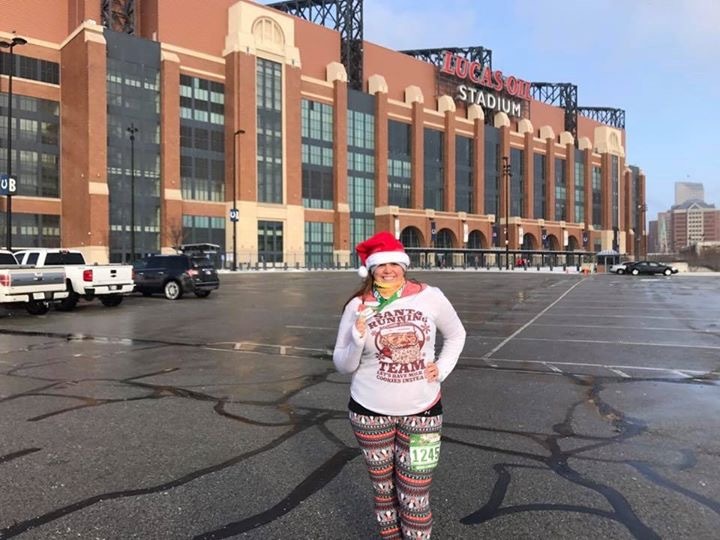 While there were several warm weather cities (you’ll see where I am going with this), we opted for the Indianapolis race as Candace’s family lives there so we could couple the race weekend with a family holiday get together. Plus, we could both add Indiana to our lists of states in which we have run a half marathon. Oh, and Candace and her family, for reasons passing understanding, are huge Indianapolis Colts fans. This race would begin and end in the parking lot of Lucas Oil Stadium, which no doubt got her very excited to run it. 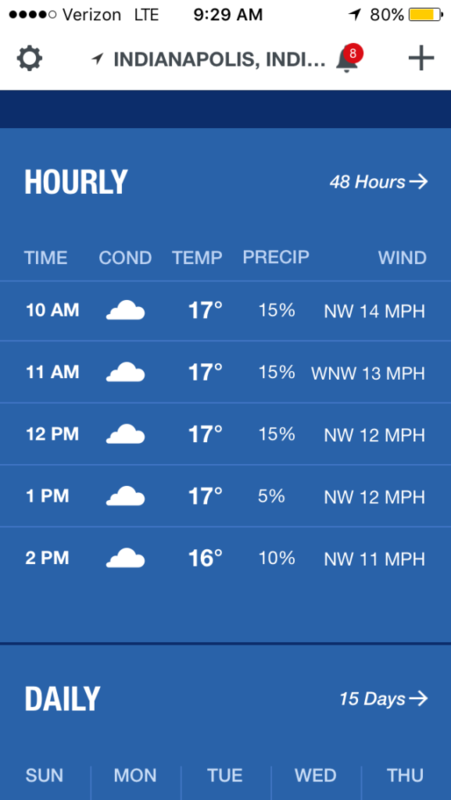 Any time you run a race in the winter, you know you are playing a crapshoot with the weather. When we were in Indy last Thanksgiving the temperatures were in the 60s. In fact, 1 year to the day before race day we ran a 10 mile training run in Columbus, Ohio in comfortably warm temperatures. This winter, however, polar vortex conditions set in early and it was COLD. We kept an eye out on the forecast and were starting to get worried about running a half marathon in such cold temperatures. This is where I have to give major props to the event organizers. They were on the ball in every way. As disappointing as it is to train for a race and not be able to run it, the Friday before the race they sent out an email letting everyone know that the forecasted race morning temperatures were just too cold to risk being out for a full 13.1 miles. Not only is it a danger to the runners, but also to volunteers and event staff as well. Look, we call them as we see them here at Casual Runner, and the race team and race director deserve significant props for not only making the right call, but doing so in a timely manner rather than waiting until the last minute. Thank you, and well done. Now, for those registered for the half, we were given 3 options. We could run the half as a virtual run, we could run the 5k instead (it would be going forward as scheduled), or we could do both. Well, we decided to do both. Why not? The race medals were fun holiday themed and we are never ones to let SMOs go to waste! (More on that later). I imagine that, with the cancellation of the half marathon, the expo was significantly stripped down from what it would have been otherwise. The expo was held at the JW Marriott in downtown Indy, which is a very cool part of town. The hotel is located in the center of the baseball stadium, convention center, museums, and the NCAA headquarters, and is not far from the stadium race start. We walked in and were greeted with shot glasses full of mini M&Ms and as many chocolate chip cookies as we could eat without risking instantly developing diabetes. OK, these are my kind of runners! 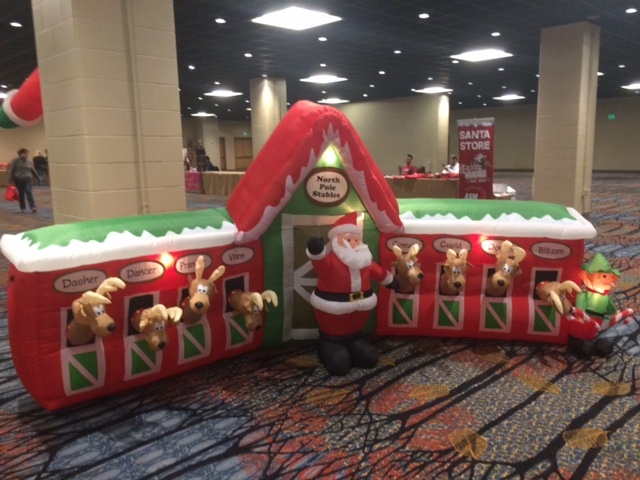 There were Christmas inflatables and cutouts for photo ops in the middle of the ballroom. The volunteers and race staff processed us quickly and set us up to run the 5k while giving us our swag and half marathon medals (which we will earn as virtual runs in the future, when the weather gets better!). We grabbed some more M&Ms and were soon on our way. Runners received a holiday-themed long sleeved tech shirt WITH A HOODIE! OK, I know I am on record by saying races give out too many long sleeve shirts, but this shirt is great. I love the material, I love the design, and I love that it as a hoodie! It also has thumb holes in the sleeves. All in all it is one of my favorite race shirts. (Check down below in the SMOpinion section for a picture of the shirt, but there is a sneak peek just below). Also included in the race entry was 1 free beer per runner at the post-race party. When viewed in light of the cookies and candy, clearly these organizers know their way straight to a Casual Runner’s heart! 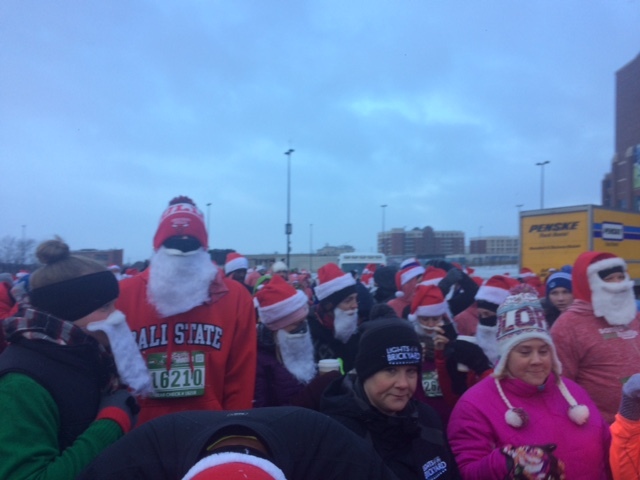 For good measure, each runner received a Santa hat and beard, which several runners sported on-course. Did I mention that it was COLD for race morning? The name of the game is layering up. My race outfit consisted of not 1, but 2 pairs of running pants, an Under Armour base layer long sleeve top PLUS a long sleeve running shirt PLUS a hoodie sweatshirt PLUS a running vest to serve as a windbreak. Before and after the race I was freezing. During the race I did sweat a bit, but was otherwise comfortable, so I suppose I hit the right combo of layers. 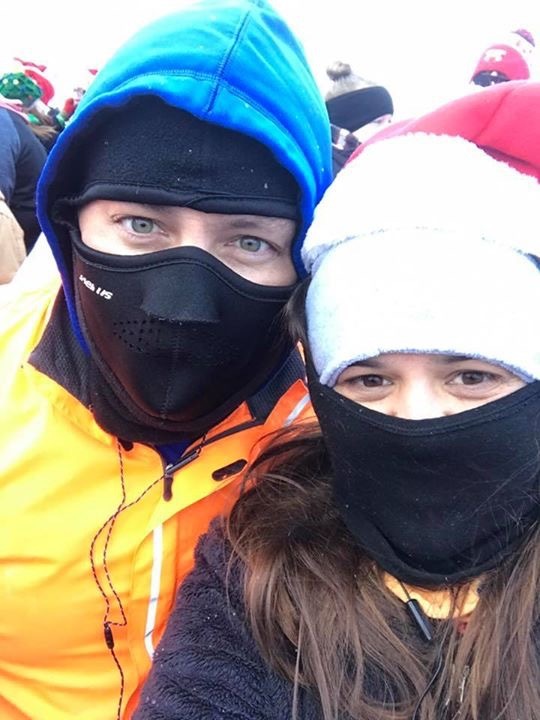 I also had running gloves and a full face ski mask that covered my entire head and face. I was ready for this one! There was supposed to be a costume contest, and Candace had worked hard planning out her ensemble. However, as the forecasted temperatures kept dropping, so did her interest in costuming up. So, like me, she loaded up on the layers instead. We do not know if they still went forward with the costume contest at this event, but it is something to look forward to at future events. While we did not get much snow on race weekend, the cold temps plus precipitation meant that Ohio and Indiana were covered with ice, which made driving and even walking treacherous. The local road crews really did a great job of getting out and making sure the main roads were as clear as they could be under the circumstances, which also carried over the course itself. We made our way downtown and saw some parking lots several blocks away actively trying to get us to park there. We were glad that we did not take the bait as, with the cancellation of the half marathon, the stadium parking lot was open, and we were able to park (for free no less) just a stone’s throw from the starting line. Because of this, we were able to spend an extra 10 minutes staying warm in the car, emerging just in time to enter the coral as the National Anthem was about to start. 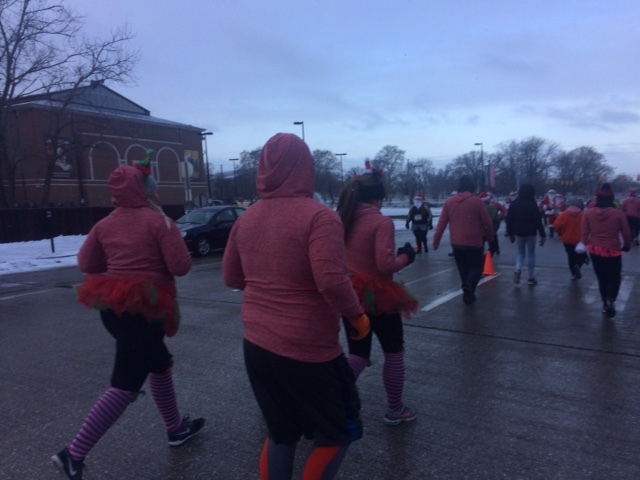 We appreciated our fellow runners that morning as we made our way to the center of the corral and used our fellow runners as wind breaks – again, anything we could to keep warm! There were a few last minute safety warnings and then we were off! The race employed a mass start, which, you all know I usually hate. They had a good turnout for this race, but the field wasn’t too large, making a mass start feasible. However, my biggest issue with the race was the start. The starting line was in the stadium parking lot, and then we made a quick right turn followed by a left turn. This resulted in some overcrowding at the start and the field bunched up. Had they started us either on the main road or further back in the parking lot, the crowd would have thinned out before the first turns. Just a small point, but an important one, especially if you plan on running for time. OK, now for the course. If you do not know anything about downtown Indianapolis (like me, before this race), you are in for a real treat. Downtown Indy is gorgeous. The architecture is impressive, and reminds me of a mini-Chicago. This makes for a fun 5k course to run. We ran past Union Station, the Christmas village, and several hotels (all of which were decorated in their holiday finest). We were treated to some of Indy’s downtown monuments as we made our way to the turnaround just beyond the canal (it was an out-and-back course). I have to give the biggest shoutout to the volunteers. Now, we all know that volunteers are crucial to making any race successful. But these volunteers went above and beyond, coming out to staff the course with windchills hovering around zero degrees. On the course we received water (which, somehow was not frozen), M&Ms and other candy, and cookies! OK, given that I had a full face mask on, I could not enjoy these on the course, but I made a point to stop and thank the volunteers for coming out, especially the young girl who handed out cookies with the sweetest smile on her face despite the cold temperatures. Seriously, hats off to all of you and thank you for your support! Unexpected Magic. The out-and-back course worked out nicely as we were able to see and encourage the other runners as we were passing by. We saw an amputee on our return trip who looked as though he could not be more happy or proud to be participating in this 5k, no matter what the race day conditions were. These kinds of moments really do stand out and stick with you. 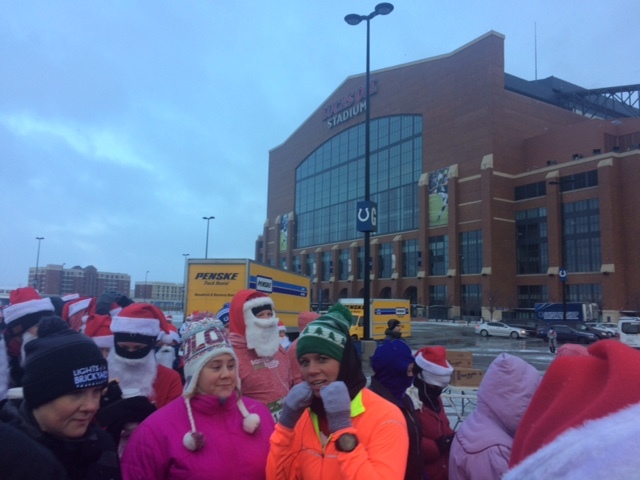 We made our way back towards Lucas Oil Stadium, reversing the way we left, so we knew there would be a slight uphill into the parking lot towards the finish. Like I said, crews did an excellent job of clearing the course of ice and snow, but there were still some slick spots. So we did not leave it all out on the course, instead we took our time and watched our footing as we navigated the last few turns and made our way up the slight hill to the finish of this fun race. Fun. Fun. Fun. I Like these medals. They are of a good quality and they fit the event theming well. The 5k medal features a Santa hat and the half marathon medal is a Christmas stocking. I assume the medals are the same over the various race cities in the series, but the lanyards we received were specific to the Indy event. The lanyards are a nice quality and have attractive designs. It is clear that the race organizers spent some time on these and I am all too happy to add them to my SMO collection! As we neared the finish I noticed that there were not that many runners staying around the post-race area. 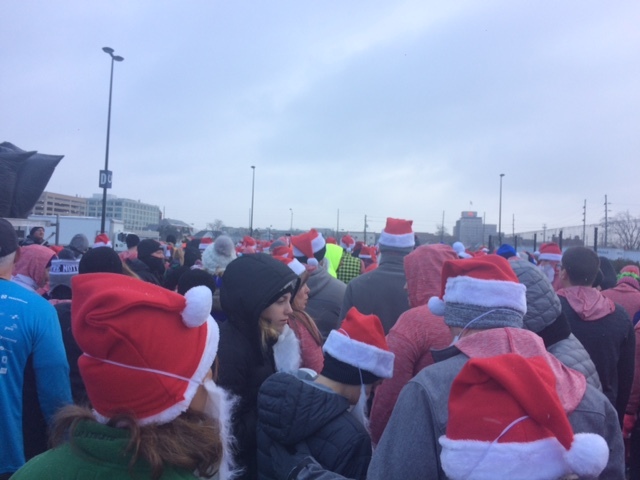 As we finished, I heard race officials encouraging people to get their snacks and head off to get warm (many headed to the post-race party at a nearby bar, but we had to skip it as we had other family obligations that involved lots of tasty bacon!). Again, serious thanks go to the volunteers and staff who were manning the finish area and making sure that they runners were taken care of when they finished the race. They had ample bottles of water, bags of potato chips, cookies, and bananas. We grabbed a few light snacks and then made a direct line back to the car to try to warm up. There is supposed to be Christmas music on the course, but, to be honest, I was so freakin cold I could not tell you whether it was there or not (if it was sacrificed due to the cold weather, I would not fault anyone in the slightest). 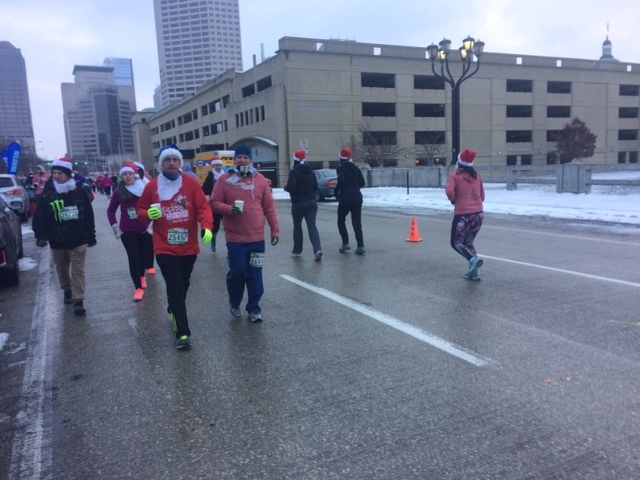 I went with a playlist of Christmas music, but since Candace and I spent the whole race together, I had it turned down lower than I normally would for a race. I would absolutely run this race again, it ticked so many boxes for me I have to consider myself a fan. Running them down, it starts with the way the race directors made timely decisions in the best interests in the runners, and then were generous in accommodating the weather changes. The swag and SMOs left you wanting to see what they do in future years so you can add more to your collection. Downtown Indy impressed me as a city, and one in which I want to run in again. On-course cookies and candy? Yes please! I also really liked the course design for the half marathon, and I really wish we could have run it. So yes, I am seriously thinking about finding a way to come back to have another try at this race, and hopefully next time the weather will cooperate! Aside from looking to enter the Indy race again, I would definitely consider some of the other cities in the the Santa Hustle Race Series. Like I said, the organizers earned my respect in putting runners first and foremost, which means I will definitely look at other events they stage.